Karthik Raja (Tamil: கார்த்திக் ராஜா) is a Tamil musician from Chennai, India. He made his debut as music composer in the Tamil film Alexander. Born to a family of musicians, he had exposure various kinds of music at a very early age. He had his formal training in Western Classical music from the Trinity School of Music, mainly in piano (affiliated to Jacob John). He also had training in Carnatic music from T. V. Gopalakrishnan and Dakshina Murthy Swami. Even to this day he derives most of his inspiration from classical music (Western and Indian) and jazz. As a child, he often used to accompany his dad Maestro Ilaiyaraaja to the recording studios and watching his dad compose would seem magical to him. Seeing the young boy so engrossed in everything happening around him, his dad spontaneously asked him to play the keyboards for one of the song recordings. So, at the age of 13, Karthik Raja played the keyboard for the song "Kannukkum" from the Tamil movie Ninaikka Therinda Maname (1987). Many such outings followed including playing keyboard for the soundtrack of the movie Nayagan. Karthik also arranged many recordings for his dad and composed his first song "Pandianin Rajiyathil" from the movie Pandiyan (1992) and "Ninaikindra" from the movie Athma (1993). Around this time, he also composed some background score for the TV series Bible. Karthik is extra fond of composing background scores for films. Many of his projects between the years of 1992 and 1995 involved composing background scores for films where his dad composed the songs. Karthik is often quoted saying that the music he makes while doing the background score gives him complete liberty to do what he likes and also gives him the creative satisfaction. He says this is when he composes for himself. The background score of his recent release Achamundu Achamundu is considered phenomenal. In this thriller-horror film, Karthik composed a 40-minute-long eerie background score where the scenes were absolutely free of any human dialogue. 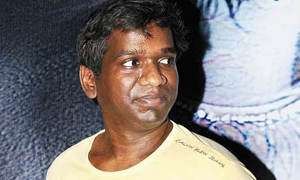 He debuted as a full fledged composer in 1996 through the Tamil movie Alexander, soon followed by Manikyam. Both were highly acclaimed for the songs and the background score. Then came many chart-busters that included Ullaasam, Naam Iruvar Nammaku Iruvar, Kadhala Kadhala and Dumm Dumm Dumm among others. He also debuted into Hindi films with Grahan which won him the R D Burman award for the best new talent. In this age of state of the art recording technology where musicians are heavily incorporating software generated sounds and overly arranged compositions, Karthik emerges as a maverick by often including single instrument interludes in many of his songs. These interludes are some of his finest compositions. Here are a few classic ones listed. Violin Dil Mera Ik Tara from 16 December (film) Hamsanada Raagam, Konjum Manjal from Ullaasam and Unakenna Raasa from Manikyam in Sri Ranjini Ragam. Metal acoustic Un Perai Chonnale from Dumm Dumm Dumm in Suddha Dhanyasi Raagam. Electric heavy metal "Vaalibam" from Ullaasam in Naata Raagam. He also known for his symphonic and jazz arrangements. He also accompanied his father on numerous outings, notably in Thiruvasagam Project.